To be fair 2 Blu-Ray discs has never been seen before in a game. I think the statement is completely accurate. 100Gb's is a lot of Gb's. What, no "get off my lawn", or "back in my day"?! Being in yer 40's ain't so bad. You get to be all silver foxy and also start to be allowed to get away with being a little bit gross in public. 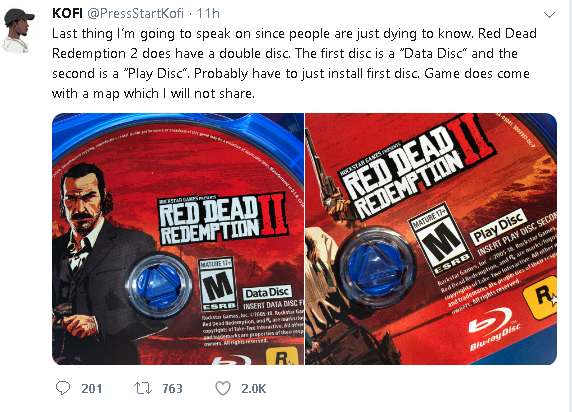 We’re here to talk about how many disks RDR2 has - y’know from the thread title - so I see no problem with discussing how many disks RDR2 has, in comparison to other games. Anyway, I’m kinda with ORG on this one; it’s a newsbite, interesting, but I don’t think it warrants arguing about. If the alternative is one disk and you download the other 50gb, I’m all good with two disks! Joining Chris in feeling old. I remember when the OG Doom was doing the rounds and everyone was like: OMG it's four discs... zipped up! I feel so fkn old! I not only remember floppy discs I remember UPGRADING to them from cassettes. Then to double density and then high density floppies! With a massive 1.44mb of storage! I have games in my collection now that come on a single High density 5.25inch floppy disk. Lands of Lore (the most underrated Westwood game of all time) is on 10 floppies. I also have Return to Zork and Ultima Underworld 2 has on 12 3.5inch floppies and Beneath a Steel Sky has 15. Then came the massive jump to CDs, but even they soon became too small as massive multi-disc games were released almost as soon as the format was released thanks to FMV. Phantasmagoria I think tops out on the CD count at 7. I have a lot with 4 or 5 (Baldur's Gate, Wing Commander 3 and 4 for example). The interesting thing is the Valve is the reason why PC games stopped supporting physical media at DVDs. Digital distribution meant that moving to Blu-Ray was pointless as no one really saw the need to replace their optical drives, and for many they simply became redundant. I am the only PC gamer I know with a Blu-Ray drive even though they are extremely cheap to buy now. So I guess to one_red_god, maybe you shouldn't try to shame people for things they find interesting. The progression of game sizes and physical media requirements is interesting. I watched my brother installing Windows 95 at launch. It came on like 15 floppies.